Even prompt washing with plain water may not completely remove all these deposits. A mild soap, safe for use on painted surfaces, should be used. After washing the vehicle, test the brakes while driving slowly to see if they have been affected by water before getting on the road. If braking performance is impaired, dry the brakes by applying them lightly while maintaining a slow forward speed. Be careful when washing the side windows of your vehicle. Especially, with high-pressure water. Water may leak through the windows and wet the interior. To prevent damage to the plastic parts, do not clean with chemical solvents or strong detergents. A good coat of wax is a barrier between your paint and contaminate. Keeping a good coat of wax on your vehicle will help protect it. Thoroughly flush the vehicle underbody and wheel openings with lukewarm or cold water once a month, after off-road driving and at the end of each winter. Pay special attention to these areas because it is difficult to see all the mud and dirt. It will do more harm than good to wet down the road grime without removing it. The lower edges of doors, rocker panels, and frame members have drain holes that should not be allowed to clog with dirt; trapped water in these areas can cause rusting. The aluminum and chrome wheels are coated with a clear protective finish. Do not use abrasive cleaner, polishing compound, solvent, or wire brushes on aluminum or chrome wheels. Use only a mild soap or neutral detergent, and rinse thoroughly with water. Also, clean the wheels after driving on salted roads. Do not wash the wheels with high-speed car wash brushes. Do not use any cleaners containing acid or alkaline or acid detergents. By using the most advanced design and construction practices to combat corrosion, HYUNDAI produces cars of the highest quality.However, this is only part of the job. To achieve the long-term corrosion resistance your vehicle can deliver, the owner's cooperation and assistance is also required. Road salt, dirt and moisture that is allowed to accumulate underneath the vehicle. If you live in an area where your vehicle is regularly exposed to corrosive materials, corrosion protection is particularly important. Some of the common causes of accelerated corrosion are road salts, dust control chemicals, ocean air and industrial pollution. Moisture creates the conditions in which corrosion is most likely to occur. For example, corrosion is accelerated by high humidity, particularly when temperatures are just above freezing. In such conditions, the corrosive material is kept in contact with the car surfaces by moisture that is slow to evaporate. High temperatures can also accelerate corrosion of parts that are not properly ventilated so the moisture can be dispersed. For all these reasons, it is particularly important to keep your vehicle clean and free of mud or accumulations of other materials. This applies not only to the visible surfaces but particularly to the underside of the vehicle. 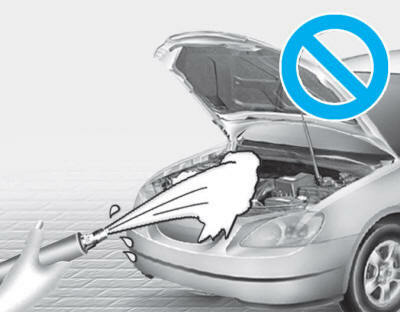 Keep your car clean The best way to prevent corrosion is to keep your vehicle clean and free of corrosive materials. Attention to the underside of the vehicle is particularly important. If you live in a high-corrosion area — where road salts are used, near the ocean, areas with industrial pollution, acid rain, etc.—, you should take extra care to prevent corrosion. In winter, hose off the underside of your vehicle at least once a month and be sure to clean the underside thoroughly when winter is over. When cleaning underneath the vehicle, pay particular attention to the components under the fenders and other areas that are hidden from view. Do a thorough job; just dampening the accumulated mud rather than washing it away will accelerate corrosion rather than prevent it. Water under high pressure and steam are particularly effective in removing accumulated mud and corrosive materials. When cleaning lower door panels, rocker panels and frame members, be sure that drain holes are kept open so that moisture can escape and not be trapped inside to accelerate corrosion. Don't park your car in a damp, poorly ventilated garage. This creates a favorable environment for corrosion. This is particularly true if you wash your vehicle in the garage or drive it into the garage when it is still wet or covered with snow, ice or mud. Even a heated garage can contribute to corrosion unless it is well ventilated so moisture is dispersed. Scratches or chips in the finish should be covered with "touch-up" paint as soon as possible to reduce the possibility of corrosion. If bare metal is showing through, the attention of a qualified body and paint shop is recommended. Bird droppings are highly corrosive and may damage painted surfaces in just a few hours. Always remove bird droppings as soon as possible. Prevent caustic solutions such as perfume and cosmetic oil, from contacting the interior parts because they may cause damage or discoloration. If they do contact the interior parts, wipe them off immediately. See the instructions for the proper way to clean vinyl. Using anything but recommended cleaners and procedures may affect the fabric's appearance and fire-resistant properties. Clean the belt webbing with any mild soap solution recommended for cleaning upholstery or carpet. Follow the instructions provided with the soap. Do not bleach or re-dye the webbing because this may weaken the seat belt.